Last year, I read Cities Back from the Edge: New Life for Downtown, an insightful 1998 book whose primary author is Roberta Brandes Gratz. I had never heard of Brandes Gratz, but learned that she is a disciple of Jane Jacobs and an unusually astute analyst of urban neighborhoods. Brandes Gratz most recent book, The Battle of Gotham: New York in The Shadow of Robert Moses and Jane Jacobs, expands upon the themes of her earlier work using New York City as a laboratory for assessing what urban development polices work, and which fail. One is hard-pressed to think of another recent book with such a perceptive, nuanced, and common sense approach to assessing how city neighborhoods regenerate. And regeneration rather than large-scale demolition is Brandes Gratz’s essential message, as she shows how nurturing the seeds of neighborhood regeneration consistently proves more cost effective and better for the public than the urban renewal, “bigness as a solution” strategy that still harms NYC and other cities. I did not realize until reading her most recent book that Roberta Brandes Gratz covered urban neighborhoods for the New York Post (well before Murdoch) and authored one of the most famous cover stories in New York magazine history – the legendary February 1978 “How Westway Will Destroy New York: An Interview with Jane Jacobs,” whose text was surrounded by a swarm of curving highways as far as the eye can see. Her background explains why Brandes Gratz writes so clearly and conversationally, a departure from far too many dry urban planning tomes. Brandes Gratz makes city neighborhoods come alive, and The Battle of Gotham is a book for activists and those interested in improving their community. Its critical sociological points do not get in the way of its readability. Brandes Gratz wrote this book for two main reasons. First, recent revisionist accounts have tried to revive Robert Moses’ record after it was decimated by Robert Caro’s classic, The Power Broker. In this goal Gratz effortlessly succeeds, reminding readers of the anti-public, anti-poor, racist agendas that drove Moses’ plans. The second reason Gratz felt a need to write this book is that despite Moses’ failed record, his “slum clearance” vision continues to be implemented in New York City and elsewhere. Gratz wrote the book as the Robert Moses-like Atlantic Yards abomination was gaining approval in Brooklyn, showing that while many planners seem to believe “we are all Jane Jacobs now,” that city officials continue to approve massive projects guaranteed not to regenerate existing communities. When you read her account of Atlantic Yards, or a similar, “urban renewal” strategy Columbia University has underway, one can only wonder why today’s planners are repeating past mistakes. The obvious answer is that money and political clout drive these land use disasters, along with a new strategy of using world-class architects (Gehry and Piano, respectively) as part of their marketing. Brandes Gratz provides important details often absent from neighborhood struggles to show in case after case that communities are not enhanced by large-scale projects brought from the outside. Among her most important points is that if you look at the flourishing of SOHO, the Upper West Side, the West Village and other communities that escaped/defeated Moses’ plans, it shows what would likely have occurred in the neighborhoods demolished by the Cross-Bronx Expressway and other ill-conceived Moses-backed projects. To put this in San Francisco terms, imagine what a wonderful community the Fillmore would now be if Redevelopment had not demolished the neighborhood. And SOMA would be less sterile if urban renewal had not extended well beyond the area slated for convention facilities, and these once low-income areas would have turned around. I have read many books on urban planning and development. I would put the two books I read by Brandes Gratz at the very top of the list. Her accessible writing and unvarnished analysis enables her to make her points clearly, and one not know the neighborhoods of which she writes because she does such a good job describing their features (for example, I had never heard of the Willets Point area near the New York Mets’ new Citi Field, but Brandes Gratz makes you understand just why the plans to demolish the area are so wrong.). She also focuses on the relationship between public transit and successful cities/neighborhoods. In fact, the highways vs. public transit debate mirrors the Moses-Jacobs conflict. A critical point Brandes Gratz makes that cannot be repeated often enough is that the terminology used to describe the two modes of travel is typically biased toward the former. We “build” highways but “subsidize” public transit. In truth, highways receive massive subsidies, and building public transit systems create even more jobs because of staff needed for ongoing operations. Brandes Gratz follows Jacobs in understanding that you can’t create livable cities while ignoring public transit, while a car culture prevents the type of pedestrian travel that makes cities and neighborhoods desirable. Brandes Gratz is an urban chronicler of rare talent. 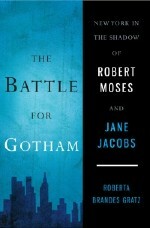 Anyone interested in improving urban neighborhoods should read The Battle of Gotham as well as her earlier book. Randy Shaw is Editor of Beyond Chron. His most recent book is Beyond the Fields: Cesar Chavez, the UFW and the Struggle for Justice in the 21st Century.